Healthy and delicious side dish or main dish. 1) In sauce pan, heat olive oil on medium-high heat. Add onions and sauté a few minutes. Add garlic and sauté an additional minute. 2) Add all spices and stir. 3) Add lentils and vegetable broth. Bring to a boil and then reduce heat to medium-low heat. Simmer for about 20 minutes until lentils are tender. 4) Serve with Basmati rice or as a side dish for your favorite entree. This recipe was made in a Whole Foods cooking demonstration that I attended. I liked it so much I made if Christmas Eve, and my brother liked it enough to make it for New Year's. 1) Chop the tempeh and onions and dice the garlic. Place the onion in a large kettle with a couple tbsp. of olive oil on medium-high heat. Saute for about 5 or 8 minutes, until onion is translucent. 2) Add the tempeh and sauté another couple minutes. Then add garlic and sauté a couple of minutes. Add the garlic last because it burns easily. 3) Add the greens and simmer until they are soft. 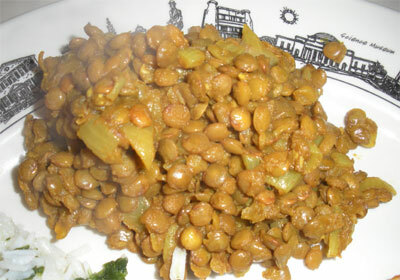 4) Drain the black eyed peas and add them along with the tomatoes and about ½ cup of water or so. Bring to a quick boil, then reduce to a simmer. Simmer about 10 minutes or more if you like. Add salt & pepper to taste. Serve with Basmati rice or couscous as a main dish or serve as a side dish. 1) Toss cauliflower with 2 tbsp. olive oil and place on a shallow packing pan. Place in preheated 450 degree oven for about 15-20 minutes or until cauliflower is fork tender. Turn cauliflower once during baking. 2) While cauliflower is roasting, heat 2 tbsp. olive oil in a large skillet on medium-high heat. Add onion and sauté about 5-7 minutes or until onion is carmelized. Add garlic and spices and sauté a couple more minutes, but don’t burn the garlic. 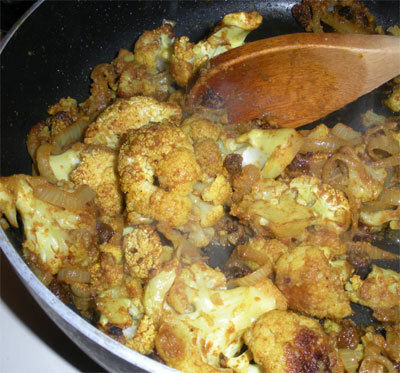 3) Remove cauliflower from oven and add to sauté pan and sauté a couple of minutes. 4) Add vegetable broth. Bring to a boil, then immediately reduce heat to low simmer. 5) Add raisins (if desired). 2 main dish servings or 4 side servings. These spring rolls are Vegan, healthy and absolutely delicious. Enjoy them for breakfast, a snack or dessert. 1) Peel and core apples. Cut into slices or chunks. 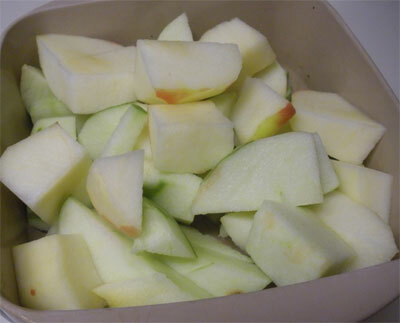 2) Mix apple pieces together with the other ingredients in microwave-safe bowl. Microwave on high until tender (about 4 minutes). 3) Heat canola oil on medium-high heat in large skillet. 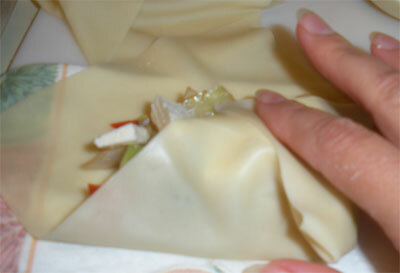 4) Place about ¼ cup of apple filling in each of the egg roll wrappers. Roll up sides and seal edges with a tiny bit of water, if needed. 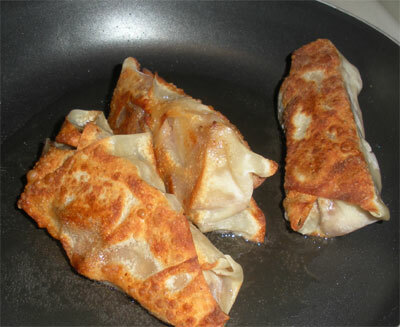 5) Place each apple spring roll in hot oil. Fry a couple of minutes until brown on one side. Turn with tongs and fry the other side. 6) Remove and place on paper towel to drain excess oil. Sprinkle with cinnamon and powdered sugar, if desired. This is a super-easy side dish to prepare and everyone loves it. 1) In a deep, large kettle, add half of the olive oil and bring to medium high heat. 2) Add the minced garlic and quickly stir fry (a minute or less--don't burn it). 3) Add the spinach in bunches, stirring it from the bottom. Add remaining olive oil and water and continue stirring. Spinach will quickly wilt down. 4) Remove from heat once spinach wilts. Stir this sauce into your sauteed vegetables or tofu for great flavor. 1/4 cup water plus 1 tbsp. 1) Whisk all ingredients together. 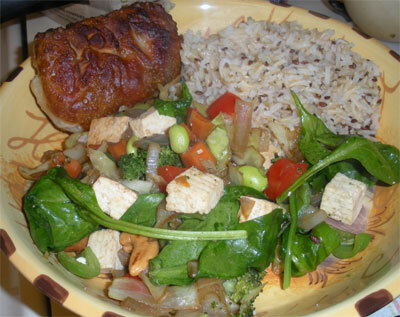 2) Pour over stir-fried vegetables and/or tofu and stir. Try these savory toss-ins with couscous for an easy side dish. 1) Boil water or stock. Add couscous and remove from heat. Stir and let set a couple of minutes. 2) Stir in olives, capers, basil and garlic. The hardest thing about making these is chopping the vegetables. They are worth the effort! ½ tsp crushed red pepper, if desired. 1) Heat 1 or 2 tbsp. canola oil and soy sauce and crushed red pepper (if desired) in wok on medium heat. Add chopped onion and sauté a few minutes. 2) Add broccoli and cabbage and 1 or 2 tbsp. of water. 3) Add carrot and red pepper and stir fry together. 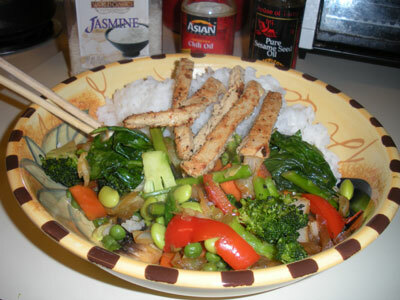 4) Add mushrooms and tofu last. Stir fry mixture together until vegetables are tender. Remove to bowl. 5) Heat remaining canola oil in large frying pan to medium heat. Place ¼ cup (approx) of filling in the center of each egg roll shell. Roll bottom up and then each side and then top portion up to form the roll. Place in hot oil seam side down. Fry until brown on the bottom (a couple of minutes). Flip with tongs and cook the other side. 6) Remove to paper towel to drain and dry. Serve with dipping sauce, if desired. Makes 8 egg spring rolls. Perfect topping for waffles or delicious stirred into oatmeal or served with vanilla ice cream. 3) Serve immediately or refrigerate and enjoy later. Spicy flavor gets more intense after the apples sit for a day or two. Delicious accompaniment to an Italian meal. 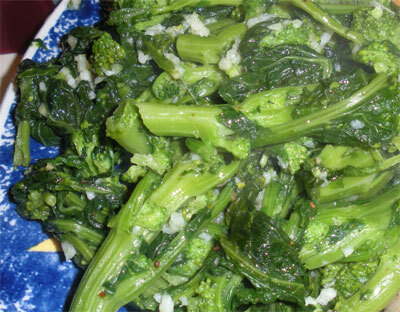 1) Wash broccoli raab and trim off and discard about the bottom 2 inches of each stem. 2) Bring a large pot of water to boil. Add a little olive oil. 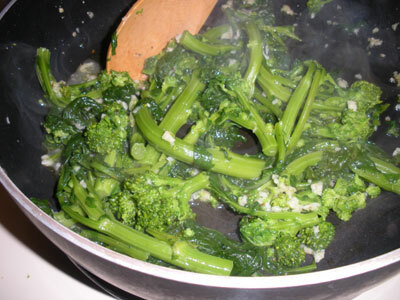 Add the broccoli raab to the water and boil about 5 or 6 minutes. 3) Drain and place in icy cold water bath for a minute. 4) Add garlic and olive oil to large pan and sauté for a few minutes. Add broccoli raab and sauté about another 10 minutes. Side dish or appetizer for two. 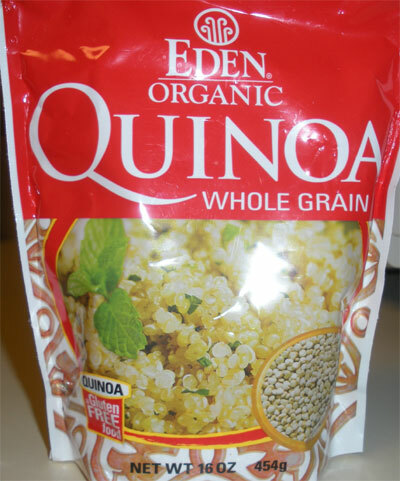 Quinoa is a gluten-free grain with great texture. It partners well with the spinach and garlic in this recipe. 1) Pour the quinoa into 1 cup boiling broth or water. Cover, reduce heat and simmer for 12 minutes. Let stand 5 minutes and fluff. 2) In large skillet, heat olive oil over medium-high heat. Add diced garlic and sauté a minute. Add shitake mushrooms and saute a couple of minutes more. 3) Add the fresh spinach and ½ cup water. Stir together for a few minutes. Spinach will cook down. Remove from heat. 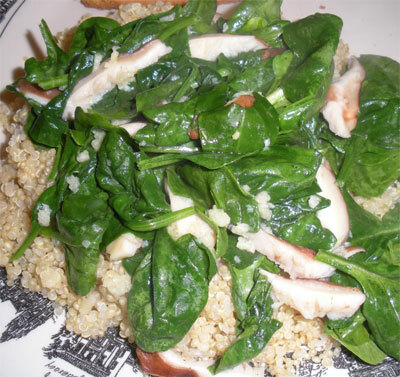 4) Place the spinach over the quinoa and serve together. Kids can’t get enough of this dish. 1) Shuck corn. Hold clean ear of corn over bowl and take a serrated knife and remove kernels from entire ear. Scrape corn cob with knife edge after removing kernels to get the “creamy” part of the corn. 2) Place butter in medium-sized kettle over medium heat. Once the butter is bubbling, add corn and stir. 3) Then add ½ cup of water and ½ tsp. salt and bring to a boil. Turn stove down to simmer and stir occasionally and add water as needed (to keep dish from burning) until corn is tender and creamy (about 15-20 minutes). Watch and make sure it doesn't burn. 4) Remove from heat and add salt to-taste. This Southern classic is great as a side dish or appetizer. 1) Beat together egg and millk. In separate bowl, stir together flour, cayenne and pepper. 2) Heat canola oil over medium heat in large skillet. Slice tomatoes about ½ inch thick. 3) Once oil is hot, take each slice of tomato and dip it first in the egg and then the flour. Do both sides. Place in the hot oil. Depending on the size of your pan and your tomato, you can probably fry one tomato at a time. Fry on one side until it is brown and crispy (a few minutes). Flip and fry the other side. 4) Remove and set on a paper town to drain excess oil. Vegetarians don’t have to deprive themselves of delicious chili on their veg dogs. 1) Heat olive oil in skillet on medium-high heat. Add chopped onions and sauté about 5 minutes, maybe a little longer, until translucent. 2) Add ground veggie burger and spices. Stir together and cook in the pan about another 5 minutes. 3) Add to your veggie dog. Makes plenty of chili for two hot dogs. A nice topping of chili for four dogs. Perfect for your Summer cookout. 1) Mix first five ingredients together in large oven-safe pot. 2) Add sauce ingredients and stir together. 3) Bake in 350 degree oven for 30 minutes. After 30 minutes, reduce heat in oven to 250 degrees. Bake uncovered for an additional one hour. Cover dish with foil and bake another 30 minutes. Great, easy way to enjoy Summer vegetables. 1) Heat olive oil in medium sauce pan on medium high heat. Add onion and saute a minute or two. 2) Add squash and saute until both squash and onion are tender. 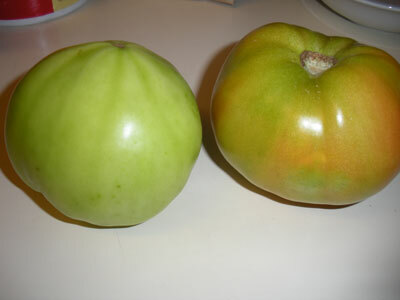 3) Reduce heat and add tomato, salt and pepper. 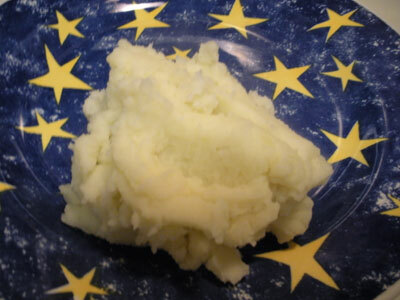 It took me a long time to figure out how to make good mashed potatoes. Make them healthier by using low-fat buttermilk. Buttermilk is lower in fat than regular milk and it also gives the mashed potatoes extra flavor. 1) Fill medium-large pot ¾ full with water and bring to boil. Add ½ tbsp. butter and good dash of salt to water. 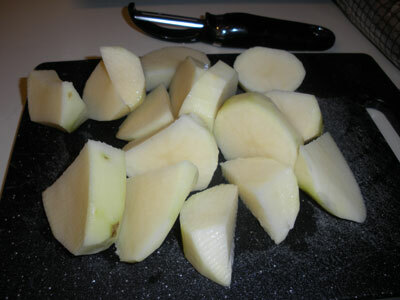 2) Wash and peel potatoes and cut into large chunks. 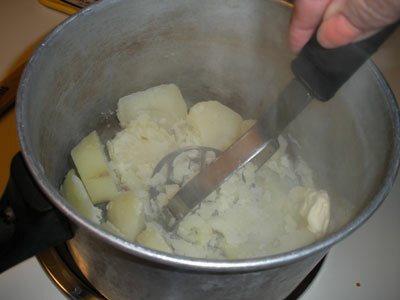 3) Add potatoes to boiling water and boil about 15 minutes or until fork tender. 4) Drain water from potatoes in colander and return drained potatoes to cooking pot. Add remaining butter and milk and salt and pepper. Mash with a potato masher until lumps are gone and potatoes are smooth and creamy. Feel free to add roasted garlic, sour cream, chives, cheese, or whatever you like. Leave the potato skins on if you like them that way. I don’t like skins in my mashed potatoes. These are delicious. Great for breakfast, lunch or dinner. Try them as the main course with a large salad on the side. 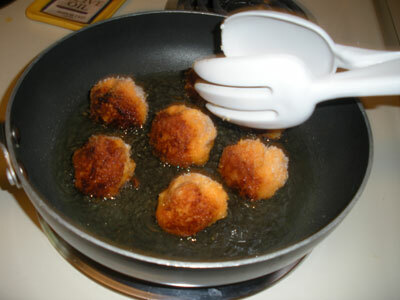 1) Heat oil to medium-high heat in skillet. 2) Combine mashed potatoes, onion, flour and salt & pepper. 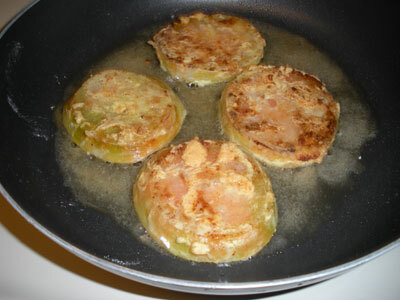 3) Using your hands, form potato mixture into small patties. 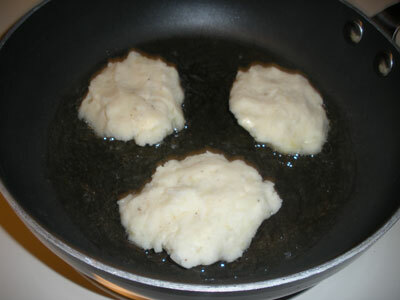 4) Place patties into hot oil. Fray a few minutes on one side. Flip and cook the other side. Should be golden brown and crispy on both sides. Makes about 3 potato cakes. A delicious way to eat one of the super foods. 2) When baked, cut sweet potatoes in half and scoop out the insides with a spoon and place in a medium-sized bowl. Add other ingredients and mash together. 3) Scoop the mixture back into the sweet potato peels and cook in microwave for about 30 seconds. Serve. Takes about 8 minutes to prepare, including cooking time. This casserole is a hit at family get-togethers. 2. Mix the soup and milk together. 3. Place 1/3 of all ingredients in a casserole dish. Continue layering and top with cheese and onion rings. 4. 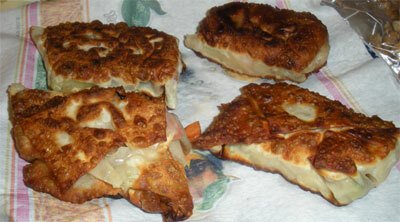 Bake for 30 minutes or until cheese begins to brown on top. A lot of people wonder the best way to cook asparagus. Roasting asparagus is incredibly easy, enhances the flavor and preserves the texture. 1) Break off the bottom 3 inches of the asparagus spear and place on a cooking sheet greased with olive oil. 2) Pour about one tablespoon of olive oil for each 10 spears of olive oil right onto the asparagus and sprinkle with salt and pepper. 3) Use clean hands to toss the asparagus with the oil. 4) Bake for 10-20 minutes depending on the thickness of the asparagus. Should be tender when tested with a fork. My mom, who is from Southwest Virginia, invented these. Delicious alternative to pasta. 1) Add the first five ingredients to a large, wide pot and bring them to a boil. 2) Stir the Bisquick and milk together until a soft dough forms. 3) Drop the Bisquick mixture by spoonfuls into the boiling tomato mixture. Then reduce heat and cook uncovered for 10 minutes. Reduce heat a little more, put a lid on the pot, and cook 10 minutes more. Dumplings should be fluffy and light. 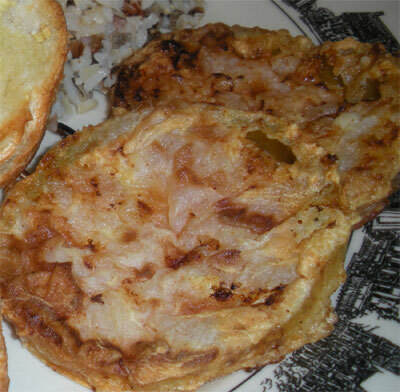 In honor of St. Patrick’s Day, here is a recipe that consists of an Irish staple. It is also inexpensive, easy to make and healthy. 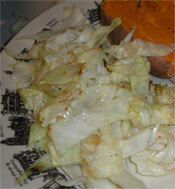 1) Cut the cabbage into thin strips. 2) In a large skillet, heat the oil on medium high heat. 3) Add the cabbage into the hot oil and stir fry for a couple of minutes. 4) Add the water, salt and pepper and reduce heat to medium. Continue to stir fry until cabbage is tender, about 10 minutes. It should be tender, but not limp. Makes enough for four side servings. My aunt shares this recipe. She made it with visiting friends one year for Thanksgiving dinner. Everyone loved it and fought for the last bit in the dish. 1) Toss ½ the cornflakes and butter together. Sprinkle half of the mixture into a greased 13 inch X 9 inch casserole dish. 2) Layer the cabbage, onion, salt, pepper. 3) In a bowl mix together the soup, milk and mayo until smooth. Spoon mixture over top. 4) Sprinkle with cheddar cheese and remaining cornflake mixture. 5) Bake uncovered at 350 degrees for approx. 45 minutes, or until golden brown. This was my grandmother’s favorite dish! 1) Heat butter in large skillet. Add sweet potatoes and sugar. 2) Sauté sweet potatoes on medium-high heat for a few minutes; flip, and sauté on the other side. 3) Add ½ cup water, reduce heat to medium-low, and simmer for 20-30 minutes. Great hot. These biscuits will make any meal better. 1) Measure flour into mixing bowl. 2) Work shortening into flour until it begins to form dough. Add buttermilk as needed to form a soft dough. 3) Turn onto a floured board. Roll out to about 1/2 “ thick. Cut out biscuits and place on greased baking sheet. Bake for about 10 to 12 minutes or until brown on both sides. *Contrary to popular belief, Crisco is 100% vegetable shortening and is suitable for Vegans. It isn't known for being a healthy shortening though, so use in moderation. Try this with a side salad of red leaf lettuce, toasted sliced almonds and chickpeas for added protein. 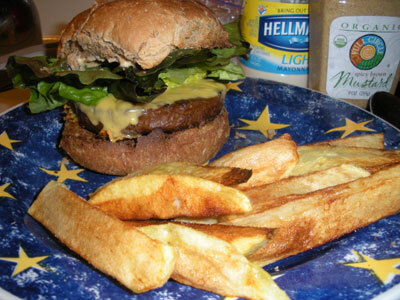 Vegans may omit cheese and substitute olive oil for butter and it will still be delicious. 1) Boil water and slowly add polenta, stirring until it thickens, about 4 – 5 minutes. 2) In large saucepan, heat 1 tbsp. butter or butter substitute on medium heat. Add 2 cloves of the minced garlic and sliced mushrooms and sauté for a few minutes. Remove to a bowl. 3) Add olive oil to the same saucepan used to cook mushrooms and heat on medium-high heat. Add one clove of minced garlic and the Swiss chard and sauté about 5 minutes (may need to add a splash of water). 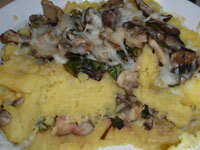 4) In a medium casserole, layer ½ of the polenta and add ½ of the remaining butter (cut into small pieces). Then add ½ of the mushrooms, ½ the chard and ½ the cheese. Repeat with a second layer. 5) Bake at 375 degrees for 7 or 8 minutes. Serve. Couscous has got to be the easiest side dish to make on the planet. 1) Boil water or broth in medium saucepan. 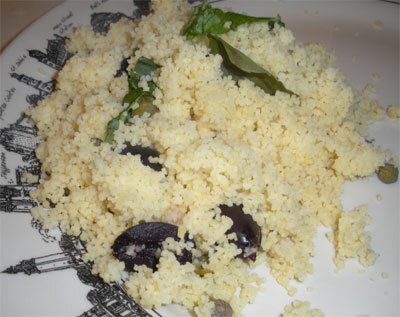 2) Add couscous and stir once or twice. Remove from heat and cover for a few minutes. 3) Stir in almonds and raisins and fluff with fork. 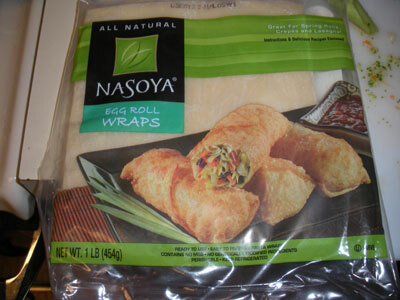 These are delicious as part of a sandwich or as the sandwich’s main ingredient. Easy to make and better than their cousin that comes in a jar. 1) Slice red pepper into long strips and spread onto a baking sheet. 2) Pour olive oil over red pepper strips and sprinkle with salt and pepper. 3) Using your hands, toss the strips to coat evenly. 4) Bake at 425 degrees for about 10 minutes. Red pepper should be fork tender. Makes enough for three sandwiches. Stores well for several days in the refrigerator. Sweet potatoes are considered to be a super food. They can take the place of a starch in a balanced meal, but are healthier than white potatoes, white rice or pasta. 1) Peel sweet potatoes and cut into large chunks. 2) Heat kettle of water to boiling, add tsp of butter to water. Add sweet potato chunks and boil uncovered about 10 minutes or until fork tender. Please check the potatoes after about 5 minutes because cooking time will vary depending on how big the chunks are. 3) Drain sweet potatoes and return to the kettle you cooked them in. Add remaining ingredients and mash with a potato masher until creamy and smooth. Allow one sweet potato for each person. Make extra for leftovers. These are a tasty treat! A yummy side dish to a meal or fabulous appetizer. 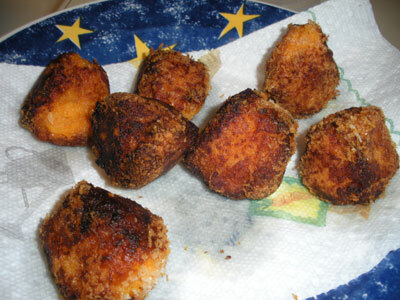 They are crispy and golden on the outside and smooth and creamy in the middle. My suggestion: make extra Mashed Sweet Potatoes one night and the next night use the leftovers for Sweet Potato Croquettes! 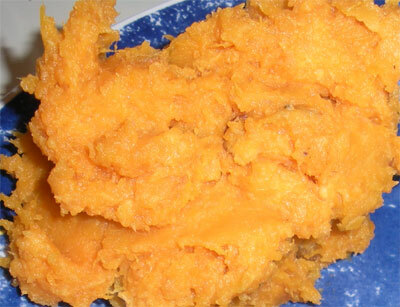 1) Refrigerate mashed sweet potatoes over night or a couple of hours. 2) Add flour to mashed sweet potatoes in medium-sized bowl and stir til blended. 3) Put Panko into small bowl. 4) Heat Canola oil in large, deep frying pan on medium-high heat. 5) Form sweet potato dough into small balls, a little smaller than a golf ball. Roll each ball in the Panko. 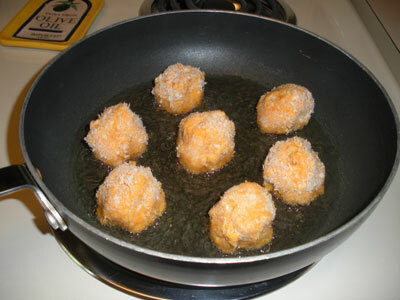 Place each ball into the hot oil. 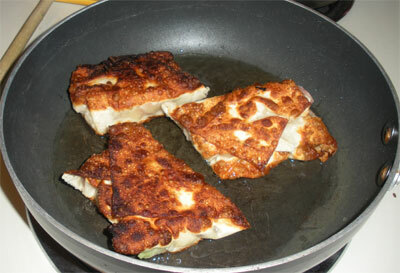 Fry a couple of minutes until golden brown, then turn with tongs and fry the opposite side. Continue turning until each part of ball is equally brown. 6) Remove to plate covered with paper towel to absorb any extra oil. Serve warm. *Panko breadcrumbs are available in almost every grocery store. 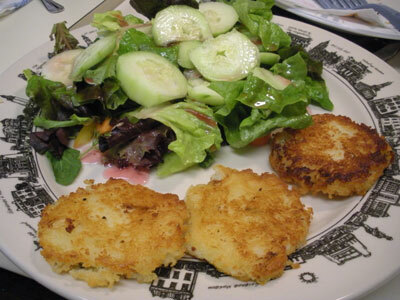 Use Panko rather than regular breadcrumbs because they give it a light crunchy coating on the outside. 1) Pour oil in iron skillet (preferably seasoned) and place empty skillet in 450 degree oven for about 15 minutes. 2) In large bowl, combine cornmeal and flour. Add buttermilk slowly until all is combined and batter is thick but pourable. 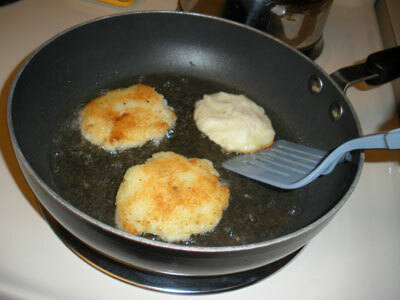 3) Remove skillet from oven and pour in the batter. 4) Return skillet to oven and bake cornbread at 450 degrees for 25-30 minutes or until golden and set in the middle. 1) Grease a medium casserole dish and set aside. 2) Heat butter in sauce pan on medium-high heat. Add onion and cook until tender. Add milk, flour, salt and pepper, and stir over medium heat until thick and bubbly. 3) Place half of the thinly sliced potatoes in the bottom of the casserole dish. Cover with ½ of sauce. Repeat for another layer. 4) Cover casserole dish with aluminum foil and bake at 350 degrees for 30 minutes. 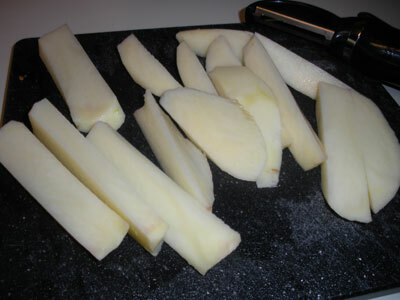 5) Uncover and bake an additional 30 minutes or until potatoes are tender. These beets make a spicy and different side dish. 1) Drain beets and reserve about ½ cup of the beet liquid. 2) In a medium-size sauce pan, mix the vinegar, sugar, cornstarch, salt and the ½ cup of beet liquid until smooth. 3) Add the butter and cook the mixture over medium heat until thickened, stirring continuously. 4) Add the beets and heat until just heated through (a few minutes). Keep stirring. Makes about 6 side servings. Don’t throw away those watermelon rinds, recycle them into delicious pickles. Note: this recipe has a lot of sugar in it - use a sugar substitute if you are trying to avoid sugar. 1) Trim dark skin and pink flesh from thick watermelon rind and cut rind into 1 inch pieces. 2) Dissolve lime in 2 quarts of water; pour over rind. If needed, add more water to cover rind. 3) Let stand 2 hours. Drain, rinse and cover rind with cold water. 4) Cook until tender and drain. 5) Tie spices in a cheesecloth bag. Combine spices with remaining ingredients and simmer until transparent. Add boiling water if syrup becomes too thick before rind is clear. 6) Remove spice bag. Pack, boiling hot, into sterilized canning jars, leaving 1/8 inch space at the top. 7) Remove air bubbles, wipe jar rims. Cover jars with metal lids and scre on metal bands. Yields about 7 pints. Pickles will be sweet and crispy. This cornbread is spicy and savory. Serve as either an appetizer or as bread with a meal. 1) Mix together the first 7 ingredients. Then stir in the onion, corn, cheese and jalapeno peppers. 2) Method one: To make as an appetizer: Slightly grease a miniature muffin pan. Pour batter into muffin cups (about half-full) and bake in a 375 degree oven for 20 to 25 minutes. Method two: To make as bread: Pour half the batter in a greased 9 x 13 inch pan. Spread the peppers and cheese on this layer and then pour the second half of the batter on top. Bake in 375 degree oven for approximately 30 minutes. 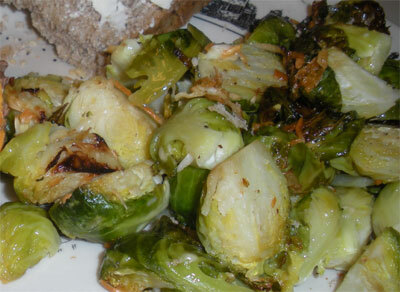 If you think you don’t like brussel sprouts, you have never tasted this dish! 1) Mix ½ of cheese and all other ingredients together in medium casserole dish. 2) Top with remaining cheese. 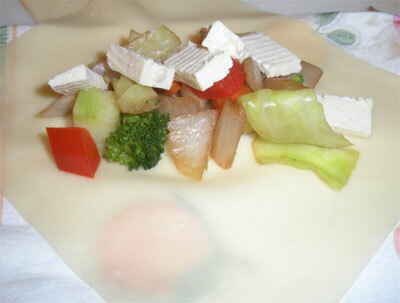 3) Bake at 375 degrees for 20 minutes or until vegetables are tender and cheese is browning on top. 1) Combine oil, vinegar, sugar, salt, pepper and dill. Set aside. Drain and rinse green beans. 2) Place about ¼ of green beans in a medium-sized glass or ceramic bowl. 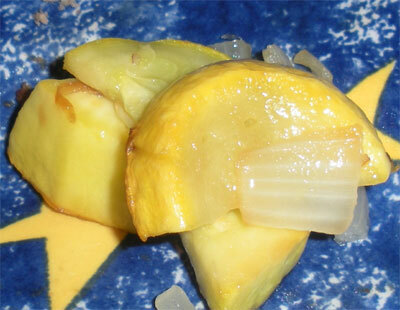 Top with ¼ of the onions and sprinkle with water chestnuts. Pour ¼ of the vinegar mixture over it. Continue layering until you’ve used everything. 3) Refrigerate overnight before stirring and serving. When I found out how easy it was to make green beans, I started making them a lot. They are especially tasty and healthy when made this way. 1) Wash beans. Cut of the ends and cut into two or three pieces, depending on size. 2) Heat water to boiling in a large kettle. Add olive oil to water. 3) Add beans to boiling water and cook for 5 minutes. Yummy twist on cornbread. Your kids won't know there's broccoli in this tasty treat. 1) Mix all ingredients and pour in greased 8 or 9 inch square pan. 2) Bake at 400 degrees for 35 minutes or until lightly browned. 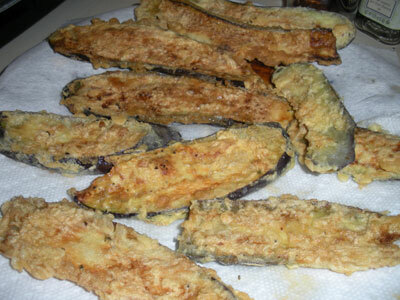 Fried eggplant can be used in eggplant parmesan, as a tasty side dish with any meal, or as an appetizer with a dip. 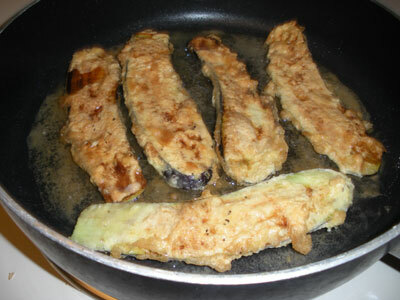 1) Slice eggplant. Slice a larger eggplant in about 1 inch circles. Slice a smaller eggplant length-wise. Leave the skins on. 2) Mix flour together with all seasonings. 3) Heat oil in large skillet over medium-high heat. 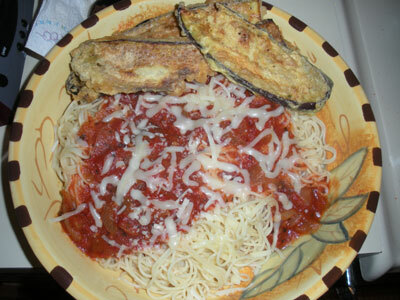 4) Dip each slice of eggplant first in the egg mixture and then in the flour mixture. Do both sides. Place in hot oil. 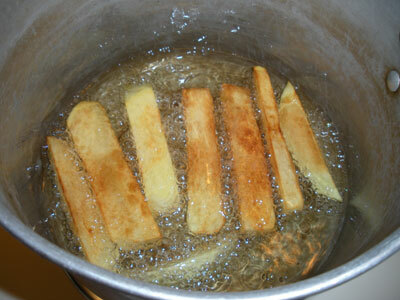 5) Fry for about 5 minutes until crispy on one side. Flip and cook the other side. 6) Remove to plate with a paper towel on it and allow excess oil to drain into the paper towel. My mom makes this casserole for family parties. 1) Saute onion in olive oil for a few minutes. Add garlic and sauté a minute more. 2) Add spinach and stir. 3) In separate large bowl, stir together egg, stuffing mix, cheeses, sour cream, salt & pepper. 4) Bake at 350 degrees in a 9 X 13 inch glass baking dish for about 30 minutes.